Interactive Map Location of Pokémon League in Torren. The Pokémon League is the building which serves as the headquarters for the Torren League. Trainers come here to challenge the powerful Elite Four in any order before eventually facing the Champion. In recent times the League has seen a massive drop in challengers due to the disappearance of the 8th Gym Leader and, thus, the 8th Gym Badge. The Pokémon League's challenge conditions change based on what Difficulty mode the player is using. On Easy difficulty, there is no difference from normal trainer battles. On Normal difficulty, the player's Battle Style is forced to Set. On Hard difficulty, the player is restricted from using items during battle while also having the player's Battle Style forced to Set; for the sake of fairness, the Elite Four and Champion will also be forbidden from using items in battle. The Elite Four and Champion battles are also unique in that the levels of their Pokémon scale with the player's party. For the teams posted for each trainer, each Pokémon's level represents the minimum level at which the player fights them in battle; if the highest level in the player's party exceeds that number, then the opposing Pokémon's level will rise accordingly. Note that there is currently a bug involving the Elite Four (and Champion) using the incorrect teams on Easy difficulty. They will use their Normal difficulty teams instead. Please do not edit the Pokémon listed on Easy difficulty, as this should be fixed in the next patch. When first challenging the Pokémon League, simply talk to the old man behind the counter after making preparations to start the challenge. The player may not leave once the challenge has started. After defeating all four Elite Four members, the entryway to the Champion's room will open after pressing the button beneath the Giratina statue in the first room. Once the Champion is defeated, go with Professor Sylvan to register the player's team in the Hall of Fame. The player will then learn that they next need to travel back to where they battled Mew in the Crystal Caves. This guide lists all the things you can do after beating the Pokemon League. The Elite Four can be faced again at higher levels after the player has subjugated Arceus at the Throne of the Hegemon. Beyond this, the procedure for challenging the League is the same aside from the player experiencing a new Champion battle. 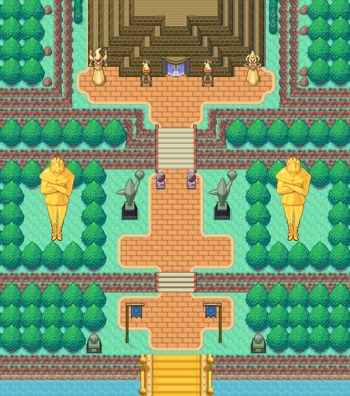 In Pokémon Insurgence, the Pokémon League is depicted as a massive pyramid with a golden bridge leading to it from Victory Road. Statues of Cresselia, Darkrai, Poké Balls and Jaern can be found on either side of the building. At the end of the bridge, the player can speak to the PikaTaxi guy to go to and from the Pokémon League. On the ground floor, the player can find a Poké Mart and a Pokémon Center in opposite corners of the room. In between these two services, the player may speak with an old man to begin their challenge. Various NPCs can be found loitering around the ground floor, of which is a Black Belt who challenges the player to complete the League challenge without letting a single Pokémon faint. When starting their League challenge, the player should first notice a statue of Giratina located in the center of the room. Once all four members of the Elite Four have been defeated, the statue moves aside to reveal a button which allows the player to proceed and challenge the Champion. To the left and right of the Giratina statue are rooms which open up to two additional rooms within each. From left to right, these rooms correspond to the rooms where the player battles Kayla, Eduard, Yuki, and London. These battles do not need to be completed in a particular order. Kayla's room is noticeably quite pink, with grass composing the border of the room and hearts greeting the player as they enter. Plants line the walkway as well as the battlefield itself. Note that Kayla's team may randomly lead with Blaziken instead of Smeargle. Eduard's room is littered with rocks while sand covers the battlefield to match his Sandstorm theme. Yuki's room has ice crystals and rocks scattered throughout, with snow forming the border of the room to match her Hail theme.